*The New Yorker Recommended Reading List! *Texas Reading Club Book List! Rooster wakes everyone, but what if Rooster doesn't wake up? 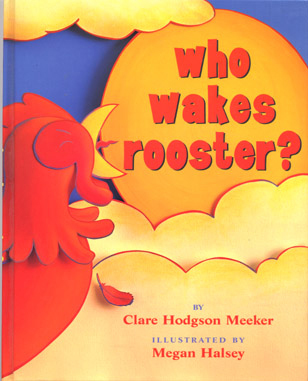 Clare Hodgson Meeker weaves a warm story around the fact that roosters rise in response to the sun's light. And Megan Halsey's stunning three-dimensional artwork beautifully captures both the peace of the sleeping farm and its bustling activity after rooster's cry.